Race to the scene of the fire aboard the First Responder! This outstanding 2-in-1 replica of a fire department SUV features a red, w hite and black color scheme, blue warning beacons, roof-mounted spot lamps, working steering and suspension, and wide black rims with chunky tires. Open the doors to access the driver's cab, operate the winch, raise the light tower and open the tool-storage compartment to select from a range of cool accessories. When you feel like another building challenge, rebuild it into an awesome Fire Racer. Price is 30% below the initial Lego retail price, a € 13.36 discount! This comes down to 6.17 cent per brick. The First Responder (42075) Lego set is available from the sites below. However, they do not offer delivery to your selected region. 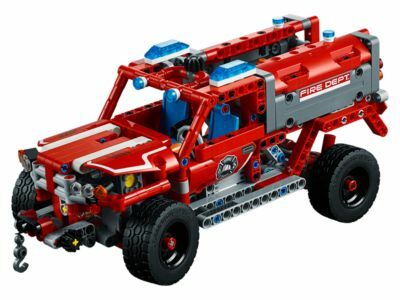 The First Responder (42075) Lego set is no longer directly available from the sites below. However, 3rd party partners of these sites might still have the set available. Alternate description Explore iconic vehicle design with the First Responder! Features working steering and suspension, working winch, raisable light tower, driver’s cab with opening doors, storage compartment with a selection of tools, wide black rims with chunky tires, blue warning beacons and roof-mounted spot lamps. 2-in-1 model: rebuilds into a Fire Racer. First Responder (with light tower extended) measures over 7” (20cm) high, 10” (27cm) long and 4” (12cm) wide, and over 4” (12cm) high with tower retracted. Fire Racer measures over 3” (9cm) high, 11” (28cm) long and 4” (12cm) wide.